Coach of the Year — Matt Nagy, Bears: Nagy is the most successful first-year head coach in team history. Hired to replace John Fox in January, Nagy led the Bears to 12 wins, the most victories by any Bears head coach in his first season since the AFL-NFL merger in 1970. 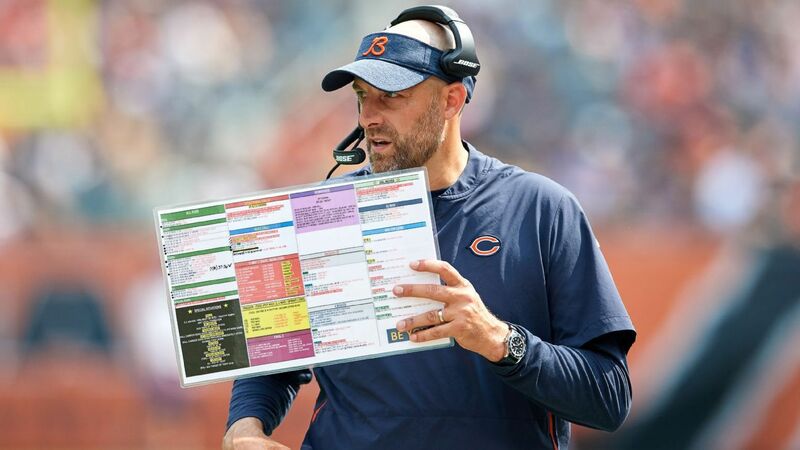 Nagy’s first order of business was to scrap the Bears’ outdated offensive philosophies and to install a version of the highly effective Andy Reid system — the scheme Nagy learned while coaching under Reid in Philadelphia and Kansas City. The results in Year 1 were better than expected. Second-year quarterback Mitchell Trubisky flourished in Nagy’s offense, as his passer rating jumped from 77.5 to 95.4. Beyond the Bears’ obvious on-field improvements, Nagy also revolutionized the culture inside Halas Hall. In the process, he accomplished the almost unthinkable: Nagy made the Bears cool again. Almost all of Nagy’s creative ideas worked. The 40-year-old transformed the postgame locker room into “Club Dub” after victories, staged weekly offense vs. defense dance-offs and routinely kept defenses guessing by using trickery inside the red zone. After years of misery for the franchise, Nagy has the Bears garnering attention for all the right reasons. Some postseason awards are easy to pick — defensive player of the year in the NFC West? It’s easily Rams DT Aaron Donald. Other awards? Wide open. Offensive MVP — Adam Thielen, Vikings: The two-time Pro Bowl wide receiver tied an NFL record in 2018 by notching 100 yards receiving in each of his first eight games of the year. His strong campaign capped off back-to-back 1,000-yard receiving seasons. Since his breakout season two years ago, Thielen has become one of the NFL’s top receiving threats and one of its best underdog stories. He rose from rookie tryout player to elite talent. Thielen quickly emerged as the favorite target of quarterback Kirk Cousins. Their chemistry helped the Vikings achieve top-10 figures in total offense and passing yards early on and allowed the offense to compensate for the run game it struggled to establish. Toward the end of the year, teams finally began to treat Thielen like a No. 1 receiver by dedicating two defenders to him, which hindered his production down the stretch. Still, by season’s end, Thielen finished tied for fourth in the league in receptions (113); he was ninth in receiving yards (1,373); and he finished tied for 10th in receiving touchdowns (10) with his teammate Stefon Diggs and New Orleans Saints receiver Michael Thomas. Defensive MVP — Khalil Mack, Bears: The acquisition of Mack from the Oakland Raiders on Sept. 1 pushed the Bears’ defense over the top. Already a respected unit before Mack’s arrival, Chicago’s D became the most feared group in the league after Mack — the 2016 NFL Defensive Player of the Year — joined the mix. Mack led the Bears with 12.5 sacks, tied for third all time in Chicago’s single-season history. Mack and Hall of Famer Richard Dent are the only Bears to reach 12.5 sacks in a single season. In his first month as a Bear, Mack recorded five sacks, four forced fumbles, one interception return for a touchdown, three tackles for loss, four quarterback hurries and a fumble recovery, en route to winning NFC Defensive Player of the Month honors in September. Mack also became the first NFL player since the Colts’ Robert Mathis (2005) to register a sack and forced fumble in four straight games. Rookie of the Year — Roquan Smith, Bears: The eighth overall pick of the 2018 NFL draft, Smith missed most of the preseason due to injuries and a contract impasse, but he recovered to have an impactful rookie year. Smith finished second all time among Bears rookies with 122 tackles, and he had 10-plus tackles in six games. The Georgia product also was the first Bears defender since Hall of Famer Brian Urlacher to record four sacks and one interception in his rookie season. The best is still to come for Smith, who doesn’t turn 22 until April. The Bears drafted Smith because of his rare combination of strength and speed, which makes him an ideal every-down linebacker in Vic Fangio’s scheme.